Can Radio Waves conquer interstellar Space and travel from planet to planet? That is the question the scientists hope to answer with Prof. Goddard’s proposed Moon Rocket, Which will contain a radio transmitter. This article was originally published in RADIO NEWS, our sister publication, in March, 1925. It shows that even 33 years ago realistic individuals were thinking ahead on the subject of radio transmission. It is rather amazing that author Willterson predicted the future so well, as evidenced by the fact that we are receiving transmissions from space today. Note the similarity of the rocket conceived by Dr. Goddard back in 1925 (shown on page 52) to a modern rocket, the “Thor” (shown here). DURING the last year, more than any-other year in history, men have been given the results of scientific radio achievements which stimulate the imagination, as a spur to lagging engineering and technical development. We have experienced the near approach of Mars, the flurry of mysterious radio impulses apparently connected with the fiery planet in some way, but the findings of this investigation *have not been thoroughly tabulated from all quarters. 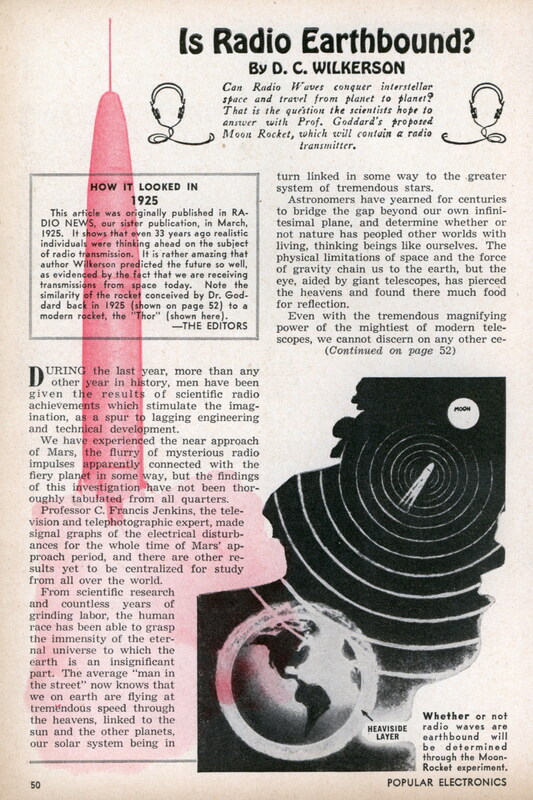 Professor C. Francis Jenkins, the television and telephotographic expert, made signal graphs of the electrical disturbances for the whole time of Mars’ approach period, and there are other results yet to be centralized for study from all over the world. From scientific research and countless years of grinding labor, the human race has been able to grasp the immensity of the eternal universe to which the earth is an insignificant part. The average “man in the street” now knows that we on earth are flying at tremendous speed through the heavens, linked to the sun and the other planets, our solar system being in turn linked in some way to the greater system of tremendous stars. Astronomers have yearned for centuries to bridge the gap beyond our own infinitesimal plane, and determine whether or not nature has peopled other worlds with living, thinking beings like ourselves. The physical limitations of space and the force of gravity chain us to the earth, but the eye, aided by giant telescopes, has pierced the heavens and found there much food for reflection. Even with the tremendous magnifying power of the mightiest of modern telescopes, we cannot discern on any other celestial body traces of life. The face of the moon, the nearest object in point of miles to our earth, discloses no vestige of animal or vegetable life. The greenish haze noted on the surface of Mars has not been satisfactorily observed generally. HEAVISIDE’S RADIO WAVE THEORY The sudden growth of radio has placed in our grasp a new force of most portentous possibilities. It is practically instantaneous. Its wave moves with the speed of light. A modern English physicist, Dr. Heaviside, has propounded the theory that radio waves are earthbound, being guided by the electrical properties of the surrounding gases. This theory enjoys great vogue among men of high authority. More adventurous minds have hoped that by means of the radio wave we might communicate with other living beings on other planets. What a masterful conception to stimulate the hopes of man! To reach out beyond our own little sphere and find other civilizations will do more to advance human thought and development than all the works of religious founders for all time. Communication from airplanes and airships between each other and with radio ground stations has given support to the thought that possibly the radio wave is not fettered to earth, and that it might penetrate to interstellar space. Electromagnetic disturbances caused by mighty eruptions shown in spots on the face of the sun have been noted on the earth and records made from them in radio stations. If such disturbances can project a radio wave from the sun to the earth, then is it not proved that these impulses can carry on through space? To obtain exact proof of this perplexing question has been a problem impossible of solution, since we had no way to set up radio waves beyond the earth’s zone of influence, until Professor Goddard first brought out his projected Moon-Rocket. THE MOON-ROCKET The Moon-Rocket has been discussed in these columns before, and a lengthy discourse about it would be out of place here. Simply, the plan is to build a giant rocket which shall move through space by the ejection-reaction principle. It will carry a series of explosive charges sufficiently powerful to drive the body of the rocket beyond the gravitational pull of the earth, the successive charges to drive the rocket to the moon. As the mighty projectile progresses through the heavens, it will be watched by thousands of astronomers who will check on its flight, speed and the place where it lands on the moon. This latter item, of course, depends upon the accuracy of calculations made for the proper time, place and direction of initial flight. TO INCLUDE RADIO TRANSMITTER It is now proposed to include in the mechanism of the rocket a small but powerful radio transmitter which shall be set in operation at the moment the rocket is released. Coincident with the verifying of the flight of the rocket by astronomers, the vast army of radio listeners will stand by their receiving sets with watches in hand noting the strength of signals as long as they shall continue. This will settle once and for all whether or not the radio wave, our only present-day hope for signaling other intelligent creatures on other planets, can conquer the void between our interstellar neighbors and ourselves. What a wonderful inspiration it will be to mankind to realize that there exists elsewhere than on earth other living, thinking beings. Some plans were made for carrying a man as a passenger in the Goddard Rocket, and volunteers were even listed for the journey. Such a human sacrifice has been discouraged, for there is little doubt but that a man thus carried could not survive the trip for many reasons. It is also believed that the first tremendous impulse of the rocket in flight would be great enough to burst the blood vessels of the passenger; therefore the idea of the passenger has been abandoned. 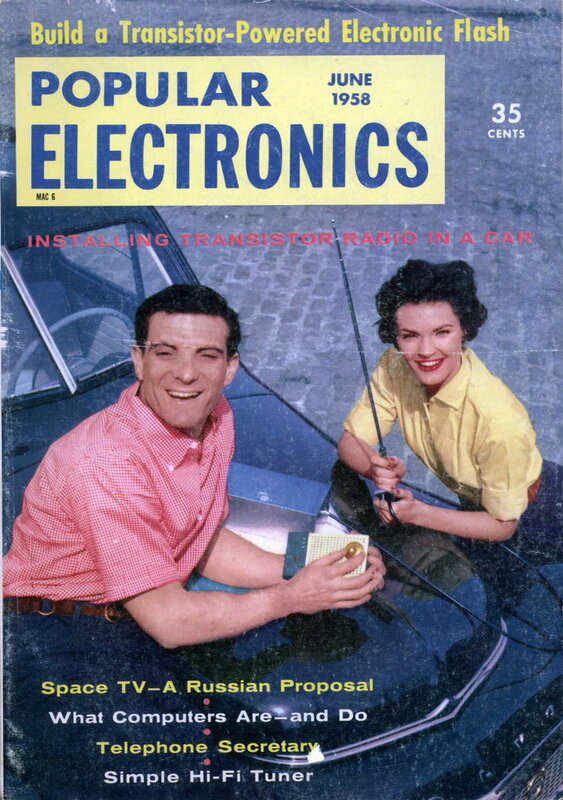 In lieu thereof, the radio transmitter has been suggested as a passenger. It will certainly provide intelligent means for obtaining important facts about the vast spaces existing throughout the universe. When the world of science knows for a certainty that the radio waves can carry through interstellar space, the time when further and more ambitious attempts to communicate with our planetary neighbors will be hastened. This may answer the cynical queries of skeptics who demand to know what use all this sort of thing is to the world. Every new scientific fact produced supplies further tools with which to better our fast-growing and complicated structure of civilization. Let us hope success crowns the efforts of all men who dare to pioneer the distant fields of our universe. I love the ‘BE A SPY’ ad on the lower left of page 110. OH! A retrospect of a retrospect!! Will this do anything to the time-space continuum? What if the original had been on the Web?? Did anyone forsee the Web — or anything like it??? Can you post that article also? The guy’s NAME is ‘Heavyside’?!? I always thought it was named for its density or thickness! Of course, just like James Van Allen, Lowe Prezure Fronte, and Yukio Ionosphere. Oh, and don’t forget Even T. Horizon. Pulse propulsion? A precursor of the Orion project? Goddard considered using a machine gun like mechanism before building liquid fuel rocket engines. Yes, a conventional explosive version of the Orion, except inside a combustion chamber. Goddard was well ahead of his time, though I agree with Eamon that here he seemed to be thinking closer to Jules Verne than what was finally used. The understanding that people could survive extreme acceleration didn’t come until the rocket sled experiements of the late 1940s. But, with the 50th anniversary of Sputnik celebrated just last year, and satellites a commonplace, we can think about how far we’ve come, and what we still can do. An adaptation for radio of ‘A Logic Named Joe’ is iTunes podcasted at Sci Fi Friday, episode #33. Thanks Jayessell, I heard it. Believe it was from the 1955 “X Minus One” radio show.